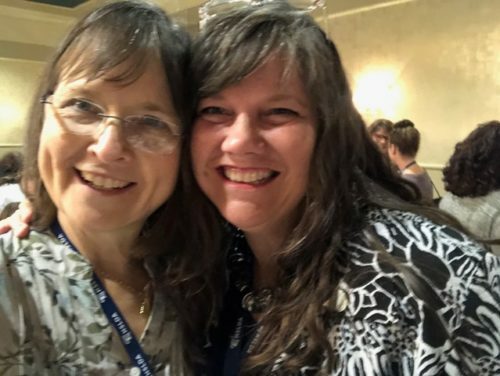 by Kathy Kuhl After two homeschool leader conferences in seven days, my head and heart are full. During these conferences I’ve met state, national, even international homeschool leaders. I’ve brainstormed with others who help homeschooling parents of kids with challenges. Wow! What a privilege. The Home School Legal Defense Association (HSLDA) hosted the National Leaders Conference. I enjoyed learning so much. Here are the highlights. What do they have in common? Most importantly, they know that more families are homeschooling students with learning challenges or special needs. How do they help? These leaders monitor their state legislatures, watching for bills that would limit your freedom to customize instruction for your kids. On their websites, they provide lists of homeschool groups across your state. They gather resources for you. However, they are volunteer organizations. While running these non-profits, many leaders are homeschooling their own kids. So look to them for help, but be patient. Tell them what would help you. Despite their limited resources, they want to do more. Now or later when your kids are grown, can you help? For example, at their annual homeschool conventions the Texas Home School Coalition and Home Educators Association of Virginia provide “Special Buddies.” This respite care for kids with special needs can make it possible for you to attend a convention. Although more states want to do this, but it isn’t easy. Know someone who can volunteer? …want to support and encourage you, too. HSLDA sent most of their special needs department to this conference to exchange ideas and information with state leaders. State leaders told them what they’ve heard from you. We all learned more about help that HSLDA already offers. Happily, I had a good long talk with my friend Faith Berens, special needs consultant at HSLDA. I love Faith’s concern for parents, her wealth of knowledge, practicality, vision, and kindness. All their consultants are kind and knowledgeable, but Faith’s the one I know best. According to Faith, HSLDA is rolling out a new, improved website. It’s always been a treasure trove of information. Now, it’s becoming easier to navigate and customize. Ever have people ask for evidence that homeschooling helps kids with learning challenges? I met two of my research heroes: Dr. Steven Duvall of Pittsburg State University, Kansas, and Dr. Brian Ray of the National Home Education Research Institute. What a treat to personally thank Dr. Duvall for his work, which I cited in Homeschooling Your Struggling Learner. Also, I met Dr. Ray, whose research on homeschooling I’ve been following for years. NHERI’s email list is your best way to keep up with Dr. Ray and NHERI’s research. (All links are at the end of this post.) I’ll summarize some of their research next week. Every year, HSLDA honors teen leaders with the Teen Servant Leader awards. One award winner was a thirteen-year-old girl with learning disabilities and chronic anxiety! 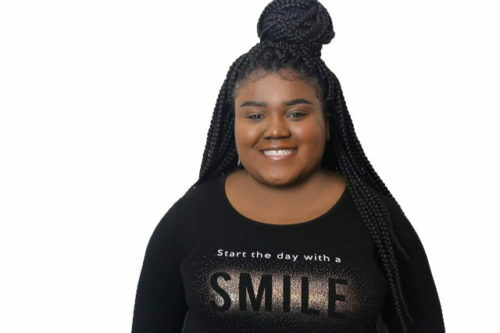 This founder of JammyGirl soaps and scented products shared the podium with her little brother. She inspired us, and received a standing ovation! Think you’ve got it hard, homeschooling in North America? (Already, it’s getting harder in Canada.) Imagine living where homeschooling is illegal and educational options are very few. I was privileged to meet leaders from around the world. Global Home Education Exchange researches and supports homeschooling worldwide. Check them out at the link below. Adopt a research scholar! For those of you living elsewhere, be encouraged! Homeschooling is growing. Wherever we live, we can learn from leaders in other countries, and support them in their work. To learn more, see the Global Home Education Exchange link below. Other homeschool leaders support homeschoolers of kids with challenges. Having lunch with Melanie Young (Raising Real Men) was a wonderful time of catching up. As the parent of a child with challenges, Melanie is empathetic and helpful. 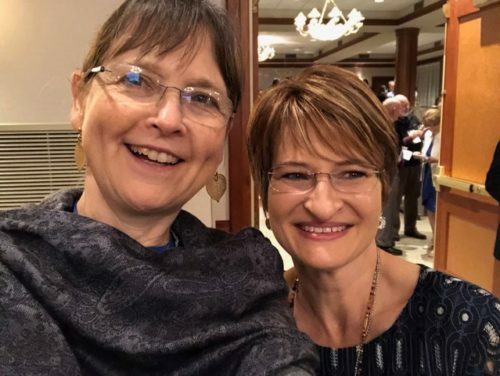 Melanie Young and Kathy Kuhl: authors, speakers, homeschoolers of kids with learning challenges. I encourage you to follow “Raising Real Men” and “Hal and Melanie Young” on Facebook. I can’t wait to read their newest books. One’s on raising tweens and the other is an ebook on accommodations. At their website, Raising Real Men, you’ll find great kits for hands-on learners, from wood carving to medieval calligraphy. I also learned that at least two online homeschool support companies provide special education consultants. They also handle your government documents and issue diplomas. I had a good talk with Beverly Munday, a consultant with Clonlara School. Angela MeKee of Home Life Academy also told me that they provide consultants and even give modified diplomas. Special needs homeschool leaders met to brainstorm and plan collaboration. 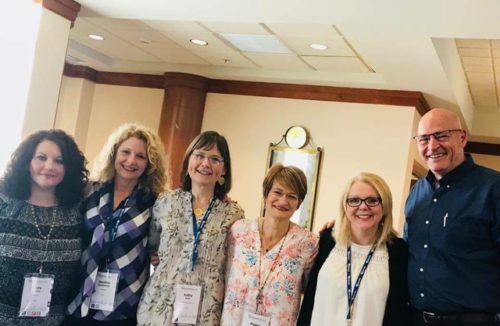 From left, Kristy Horner and Heather Frommack of HSLDA, me, Peggy Ployhar of SPED Homeschool, Faith Berens of HSLDA, and Steve Demme of Demme Learning and Building Faith Families. Most importantly, special education consultants and others concerned are discussing how to collaborate. At right, perhaps you recognize Steve Demme, creator of Math-U-See. The father of an adult son with Down Syndrome and board member of Joni and Friends, Steve supports special needs families. At last, I had the privilege of meeting Peggy Ployhar, CEO of SPED Homeschool. (SPEDHomeschool.com) I love her ideas for sharing resources and helping build support for homeschoolers. In 2019, I will join the board of SPED Homeschool. After dashing home to Virginia late Saturday, on Monday I drove to the Homeschool Trade Association (HTA) conference. Set clear expectations, and update them regularly. Always be curious what others are doing. Foster a collaborative attitude with others. Only do what you’re called to today. Take care of yourself. Accept your limits. Rainbow Resource Center offers free curriculum consultations by phone. Their consultants have no sales quota. They are just there to help you understand your choices. Home Life Academy founded the Homeschool Care Foundation, a non-profit provide counseling and aid to homeschool families in need. Another source of aid is HSLDA’s Home School Foundation. They do not require membership in HSLDA for first-time recipients. Finally, many homeschool publishers are small family businesses. When not writing, editing, and shipping, they are homeschooling. Some may have time for a long conversation with you. But sometimes they don’t. Like you, they are integrating work, homeschool, and personal life. Know other services that homeschool organizations or businesses provide for parents who homeschooling kids who learn differently? Please comment below. Thank you. HSLDA’s Struggling Learner pages are being revised. The introductory video is quite good. Meet their special needs consultant team. Invite them to speak at your support group. HSLDA members receive free consultations, access to the provider data base, and much more. JammyGirl Soap and Soothe, a business started by a young homeschooled teen with learning disabilities. Dr. Steven Duvall was interviewed here on his research on homeschooling students with ADHD. Soon, I’ll blog more on this. Also, sign up here to receive research from the National Home Education Research Institute and Dr. Brian Ray. The Global Home Education Conference and Global Home Education Exchange support spreading home education worldwide through biennial conferences and through research. The next Global Home Education Conference will be in Manila in October 2020. Hal and Melanie Young’s business, Raising Real Men, isn’t just for parents of sons. Actually, their books cover many topics. Their kits will teach your kids to make chain mail, work leather, build furniture, and more. They even sell instructions for building your own canoe! Clonlara School and Home Life Academy offer special education consultations for their members. Demme Learning employs adults with disabilities to pack their Math-U-See blocks. Don’t miss Steve’s video on teaching math facts. Peggy Ployhar is CEO of SPED Homeschool (Special Ed Homeschool, SPEDHomeschool.com), connecting homeschoolers with resources to help them teach children and teens all kinds of special needs. Here’s my blog post on their work. Rainbow Resource Center is one of several homeschool businesses to offer discounts for needy families. Their curriculum consultants can help you choose materials. Home Life Academy started a non-profit to provide for needy homeschoolers called Homeschool Care Foundation. Another great source of help is the Home School Foundation, which is becoming HSLDA Compassion. They help homeschoolers with all kinds of needs: special needs, those who’ve lost a spouse or suffered from a natural disaster. You don’t need to be a member of HSLDA to apply. I am so impressed by your passion to do what I have done since 1986. Help Homeschoolers with special needs. What a wonderful network God is building. Count me IN!